The subject of the infant Christ and St John the Baptist was a popular one in Italy and the Low Countries throughout the Renaissance, and derives from apocryphal texts dealing with the early life of Christ. 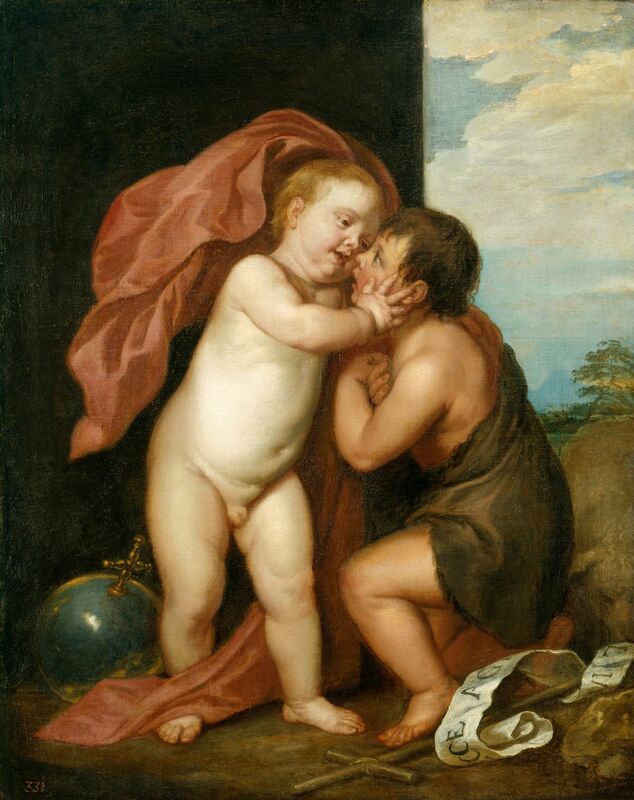 It depicts the infant John the Baptist greeting his cousin Jesus upon his return from exile in Egypt. Christ's attribute here is a cross resting upon a globe, a symbol of the power of his salvation throughout the world; John has a small cross made from reeds in the wilderness and a scroll inscribed with the words he utters in St John's Gospel (1: 29) and which, of course, refer to Christ: 'Ecce Agnus Dei, qvi tollit peccata mundi' (Behold the Lamb of God, which taketh away the sin of the world). Here John genuflects to the Christ Child, who is kissing him and raising him from his knees. The relationship between the two figures is a premonition of the Baptism of Christ, as related in Matthew's Gospel (3: 13-17), when John refuses baptism, saying 'I have need to be baptized of thee' and Christ has to overcome his reluctance. The painting is a rare example of a late religious work by Van Dyck. It is probably an autograph repetition of the painting in Lamport Hall, Northamptonshire. Both versions date towards from the end of Van Dyck's life.